Udyan Vikas Shaakha Varg III and Madhu Vikas Nireekshan Varg II. There are total 198 vacancies available in UKSSSC Recruitment 2017. Eligible individuals fulfilling essential qualifications are advised to go through UKSSSC recruitment link www.sssc.uk.gov.in and apply for desired vacancies. UKSSSC Online applications process starts from 15-11-2017 and closed on 30-12-2017. Age limit for the candidates is 21 years to 42 years. Relaxations in age applicable as per Uttarakhand Govt instructions. Application fee for UR/ OBC candidates is Rs. 300/- and for other SC/ ST/ PWD candidates is Rs. 150/-. Last date for the payment of Application fee is 30-12-2017. 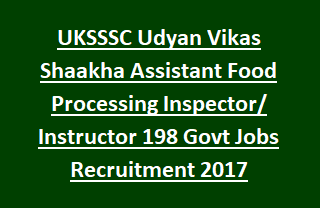 Full details regarding Application Procedure, Application Fee, selection process, Educational Qualifications, Age details, Important Dates of Uttarakhand Subordinate service Selection Commission UKSSSC Udyan Vikas Shaakha, Assistant Food Processing Inspector/ Instructor Recruitment are stated below. Total vacancies available in UKSSSC Uttarakhand Subordinate Service Selection Commission Recruitment are 198 posts. Total no of vacancies: 198 posts. 1. Assistant Food Processing Inspector/ Instructor: 13 posts. 2. Udyan Vikas Shaakha Varg II: 139 posts. 3. Udyan Vikas Shaakha Varg III: 44 posts. 4. Madhu Vikas Nireekshan Varg II: 02 posts. Assistant Food Processing Inspector/ Instructor: Candidate must have hold BSc (Biology/ Agriculture) and M.Sc in membership/ food process or PG Diploma in Fruit protection. Udyan Vikas Shaakha: Candidate must possess BSc (Biology/ Agriculture). Age of the candidate for UKSSSC Posts is 21 years to 42 years. Age Relaxation for reserved candidates admissible as per instructions. Candidate selection for UKSSSC recruitment is based on their performance in written examination. Go through the notification for application fee details. Interested/ Eligible candidates may go to the UKSSSC recruitment link www.sssc.uk.gov.in. Read the recruitment notification clearly and apply for selected post. Upload the UKSSSC Application from 15-11-2017 to 30-12-2017.